A week behind on my photo of the week posts, but guess what that means….you get two this week! Lucky you! I try to blame my PofW behindness on the lack of wifi, but that was only true once we left Ubud. The real reason is because we loved Ubud so much that we were rarely at our super-cheap-private-villa-with-a-pool because we loved wondering around in the rice fields and hanging with monkeys. In fact we love Ubud so much that we decided to extend our Indonesia trip after the Gili Islands so we could come back to Ubud to explore some more and get some work done. You guys, I was really excited about this picture. 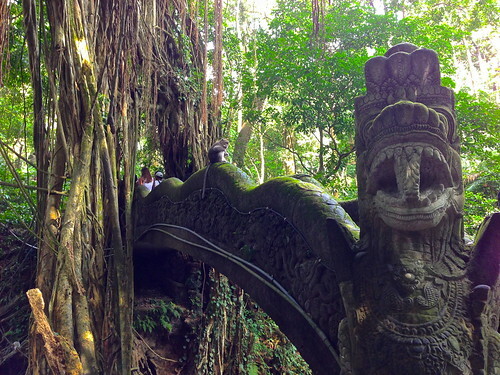 The intricate bridge, the vines, the greenery, THE MONKEY!!!! All was in my favor…except for the people. That’s right, I’m talking to you chick in the white shirt who ruined my picture (click the pic to see it larger and you will feel my pain even more)! You just couldn’t walk fast enough so I could have .03 seconds to get my shot before the other person came in to ruin the next shot (trust me I have 500 pictures of this bridge and this was the best one I could get before the monkey ran away). This people-ruining-all-of-my-pictures issue has been happening everywhere on this trip, and it drives me crazy!!!!! No, sir/madam, I do not want your I ♥ Bali t-shirt in my picture, especially when there is a monkey involved!! NAMASTE JERKS! It’s on my life list to go somewhere where there are wild monkeys running about. There’s just something about monkeys roaming free that seems like the epitome of a far away land.